About 200 frenzied devotees had tried to prevent a woman pilgrim from entering the hill top shrine, suspecting her to be of menstruating age. 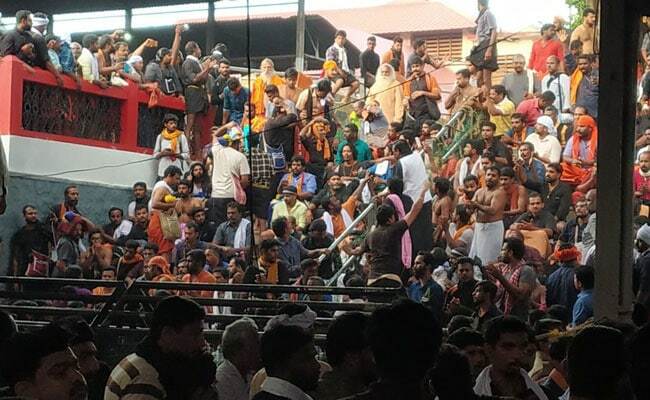 The Kerala High Court Tuesday directed the Travancore Devaswom Board, which manages the Lord Ayyappa temple at Sabarimala, to give an explanation by next week on the violent incidents there after the shrine was opened for a special pooja last week. The division bench, headed by P R Ramachandra Menon, gave the direction after perusing a report of the Sabarimala special commissioner. Earlier, the special commissioner had submitted a report to the court, where he referred to the violent protests against women devotees of menstruating age in Sabarimala and violation of temple rituals by some people when its doors were opened on November 5 for a special pooja. About 200 frenzied devotees had tried to prevent a woman pilgrim from entering the hill top shrine, suspecting her to be of menstruating age and allegedly attacked the cameraman of a Malayalam television news channel when the temple was opened for the special pooja. The state government strongly opposed the petition filed by BJP state chief P S Sreedharan Pillai, seeking to quash the FIR registered against him for a controversial speech he reportedly made in Kozhikode recently. The government's stand was stated in its counter. The prosecution alleged that Mr Pillai persuaded the chief priest (Thantri) to violate the Supreme Court order, permitting women of all age groups into the Lord Ayyappa temple. The court then posted the matter for Thursday for further hearing. The First Information Report was registered in Kozhikode on a complaint by journalist Shybin, alleging that Pillai, while addressing a meeting of Bharatiya Janata Yuva Morcha state council, had instigated activists to protest the entry of women of menstruating age into the hill shrine. In his petition, Mr Pillai claimed that he had not made any statement with an intention to cause any fear or alarm among any section of the public, so as to induce a person to commit an offence against state or against public tranquillity. Kerala has been on the boil after the September 28 Supreme Court verdict, permitting women of all age groups into the Sabarimala temple, with right-wing and Hindu outfits on the warpath over the state government's decision to go ahead and implement the top court verdict.